Putin Says Russia Is A Bear "Just Eating Honey," So Leave It Alone, Europe! It's been awhile since we've heard from Russian President Vladimir Putin, and his annual live news conference on Thursday did not disappoint. Speaking from the Kremlin in Moscow, Putin addressed Russian concerns over the Ukraine, the flailing economy and so-called European aggression, while making possibly the best animal analogy in the history of presidential press conferences. And in case you were wondering what Putin has been up to, personally, it sounds like the newly single politician has found love again — it was quite the three-hour press conference. Unsurprisingly, much of Thursday's news conference focused on Russia's tenuous relations with the Western world, stemming from the ongoing crisis in the eastern Ukraine. Putin defended his actions, including taking back the Crimea from Ukraine, by drawing on the nation's bear mascot, a Russian symbol that has been used for centuries. Who can forget the adorable 1980 Moscow Olympics mascot, the teddy bear Misha? To chop Texas from Mexico is fair, but when we make decision about our territories it is unfair. Do they want our bear to become a stuffed animal? Maybe our bear should sit quietly, not chasing any piglets around, but just eating honey and berries. Maybe they should just leave him alone? They will not. They are trying to put it on a chain. And as soon as they do it they will tear his teeth and claws out. The only thing we've done is protecting our interests in a tougher way. We're not aggressive. We're not attacking anyone in the political sense of the word. However, Russian interests have been harshly impacted by Russia's involvement in eastern Ukraine and the Crimea, which eventually led to international sanctions placed on the country by the United States and the European Union. Putin said the sanctions are responsible for 25 to 30 percent of the drop in Russia's currency value. According to ABC News, the ruble, Russia's currency, has lost half its value over the last year. The Russian president assuaged his citizens, saying the economy would recover in about two years. 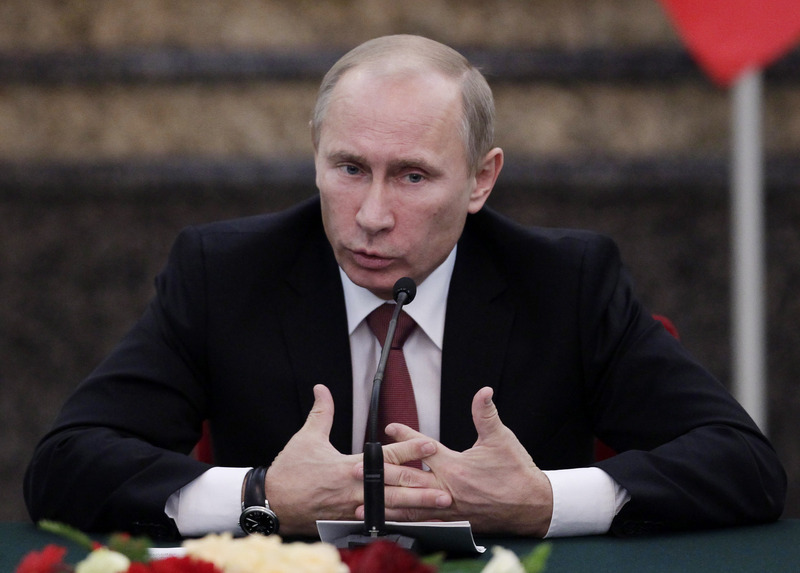 "Our economy will overcome the current situation," Putin said. As for his love life, Putin wants everyone to know that he's OK — more than OK, in fact. After his sweet, romantic gesture of wrapping his jacket around the shoulders of China's first lady in November went viral — and was censored in China — Russia's most eligible bachelor received a ton of admirers. But it looks like he may be a bachelor no longer. My friend from Europe asked me, "Do you have love? Do you love someone?" I said, "Yes." "And does someone love you?" I said, "Yes."